Why should I register for warranty? 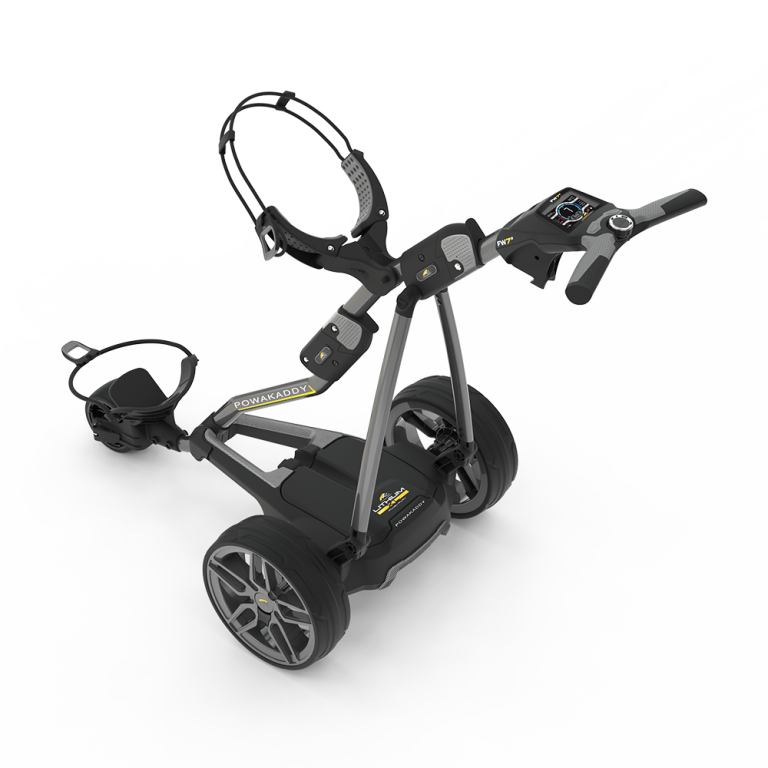 Your new PowaKaddy electric trolley comes with a 2 year* warranty (*Lithium battery has 5-year full warranty; *Lead Acid battery has 1 year warranty only). Find out more about our Warranty Terms. Should you be unfortunate and have a problem while your trolley, battery or charger are in warranty, PowaKaddy or its Service Agent will need to see your proof of purchase. Registration normally means that, if you have lost your proof of purchase, we can still easily verify the situation on line. You will find Owners Manuals and Battery & Charger instructions here. You can read them, download them or print them. Please take the time to read them! Before going further do read the instructions that come with every battery and charger supplied by PowaKaddy. My new battery gets round but seems a bit sluggish at the end? My battery is failing prematurely. Is there anything I can do to try and improve it? A friend has told me to fully discharge the battery as this will improve its performance? Will the battery be damaged if I leave it on charge all of the time? Can I play more than 18/36 holes in one day? I only played a few holes do I still need to recharge the battery? I’m not using the battery for an extended period. Can I disconnect it from the charger? I play at least 4 times a week with my 18/36 hole battery is this too much for one battery? I dropped the battery and there is a dent in the case? Can I connect my charger to the mains using a time switch? I use an extension lead to plug my charger in, will this affect the charging of the battery? Can I use a different charger? Most Lead Acid batteries seem to die in their second or third season and often without any apparent reason. Lithium Batteries have a longer warranty and last longer. Very hot weather and very cold weather don’t help; failing to charge the battery after use doesn’t help; carrying heavy bags doesn’t help. Even batteries that are treated identically have different life spans. A new battery does take time to fully “activate” it will get better with each round and can take up to 6 rounds to reach peak performance. First check that the trolley is running well with no excessive noise and with the wheels running freely. Secondly, have your charger checked to make sure that this is not the problem. You should always have your charger checked when replacing your battery. A faulty or unsuitable charger can ruin your battery in a matter of rounds. Keep your battery on charge permanently. Keep the weight of your bag to a minimum. This is VERY BAD advice. Do not do it. Draining a battery excessively will damage the capacity of the battery and the battery may never recover. Draining a Lead Acid battery to less than 8 volts means that the charger will not recover the battery and will invalidate warranty. Deliberately discharging a Lithium Battery is fatal for the battery and will again invalidate the warranty. A PowaKaddy charger is designed to recognise a PowaKaddy battery and knows when the battery is fully charged. So, it will not damage the battery. However today’s “best practice” says that, when the charger light goes green and the battery is fully charged, it is safest to remove the battery from the charger. With a Lithium battery, when the green light shows, the battery is ready to use. Conversely, if the green light doesn’t show after charging for 12 hours, something is wrong. You should have the battery and charger checked by a Service Agent. Standard Battery: the battery is for 18 holes and needs to be charged for a minimum of 12 hours after the round. We are aware that some golfers will try to stretch these batteries to 27 holes, this may damage the overall capacity of the battery and may result in an early failure. Extended Battery: this can handle the occasional 36 holes and this is as much as you should use it for before fully charging it again. Regularly using the battery for two rounds of golf on consecutive days means that the battery cannot be fully re-charged in between and will damage the overall capacity of the battery. This will result in an early failure. If you regularly play two rounds of golf in one day, buy two batteries. Yes. Regardless of the number of holes played the battery must be charged every time it is used. Yes, first make sure the battery is fully charged. Our advice is to store the battery in a cool dry place and, if possible, recharge monthly. This level of use is fine. This is normally terminal for a battery because the cells or circuit components inside may have been damaged. Exercise extreme caution in such a situation because the protection circuit module may have been disabled thereby increasing the risk of fire. You should have the battery and charger checked by a Service Agent. Yes the charger does get hot. It may even get hot enough to damage polished surfaces or carpet. With this in mind don’t place the charger on a surface you value! Charge in a dry, ventilated area on a hard surface. No, this does not guarantee the battery will be fully charged. This can affect the charging of the battery especially if you have other appliances plugged into the same extension. To guarantee a good charge then plugged into the wall socket direct is best. Before going further do read the instructions that come with every trolley supplied by PowaKaddy. We also list below a few of the questions we get from time to time. Should I have my trolley serviced? Yes, it is best to check nuts bolts and screws from time to time to make sure they are all secure. All of these are set during manufacture using a torque setting but vibration over a period of time might loosen them. So the best guide is hand tight. Also check (visually) wiring and wiring connections. Any sign of damage to cabling or connections could lead to a serious fault with your trolley. There are drain holes in most battery trays, check they are not blocked. Should you notice damage, please contact your nearest PowaKaddy Service Agent. Many PowaKaddy Service Agents offer an annual service. To keep your trolley at the peak of its performance a service every couple of years is a good idea. Clogged wheels or bearings and misaligned components can increase the drain on your battery and limit the range of your trolley. 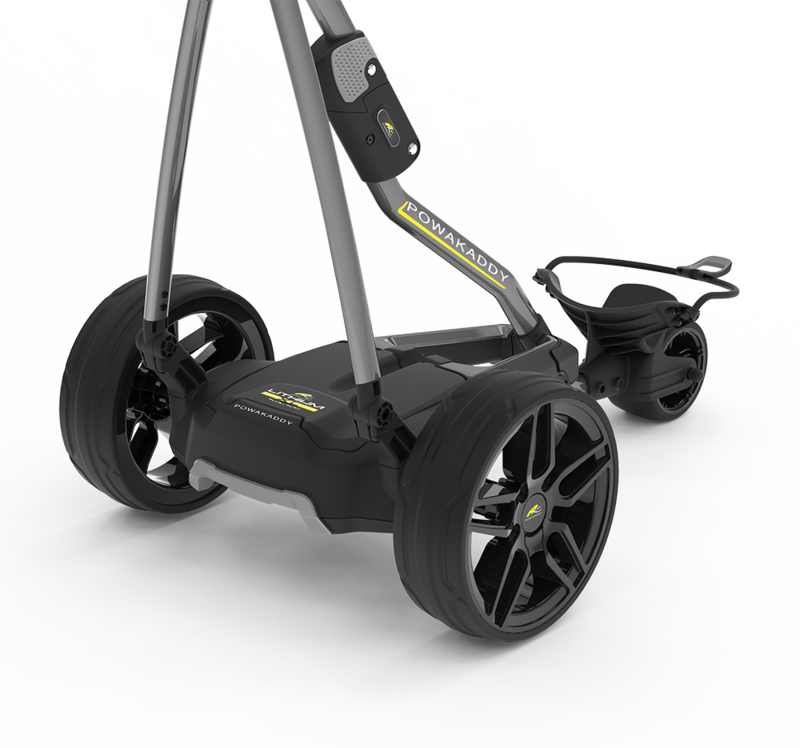 The PowaKaddy steers straight and true, as any electric trolley should. However, like any electric trolley, there are at least two conditions which may cause it to steer with a bias. The first common cause is a lop-sided bag. The offset centre of gravity tries to tip a cart sideways slightly and gives the cart an annoying tendency to steer to the right or the left. This can normally be prevented by balancing the bag so that its centre of gravity is in line with the main beam of the cart. This is why PowaKaddy offers a CartBag. CartBag pockets are laid out symmetrically on either side of the centre of the cart with pockets for balls and drinks down the centre. All the pockets are accessed from above. This means that they can be loaded in a balanced way. 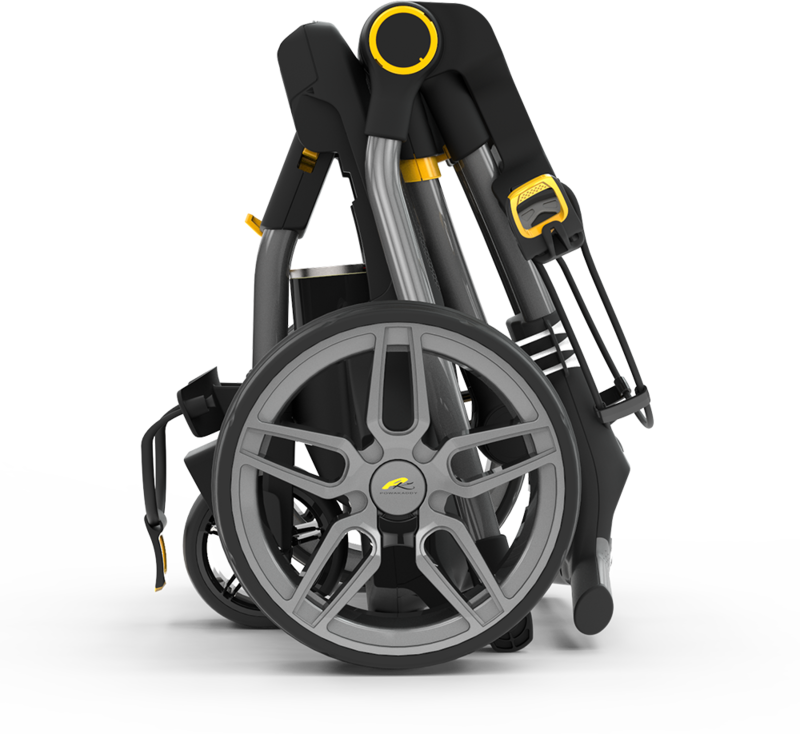 The PowaKaddy CartBag also features a locking base which prevents the bag twisting and potentially getting into a lopsided condition. This also means that your clubs are always presented to you just the way you like them. If the cart receives a bad knock, say by running at speed into a kerb or a root, slight deformations in the chassis can lead to an annoying tendency to steer to the right or the left. This is why newer PowaKaddy trolleys feature on-course adjustment of the front wheel to correct this problem should it happen. If you have an older model check if the problem is down only to the trolley, place it on flat even ground and freewheel the trolley for 10 yards. The trolley should not veer either left or right by more than 1 yard over the 10 yards. 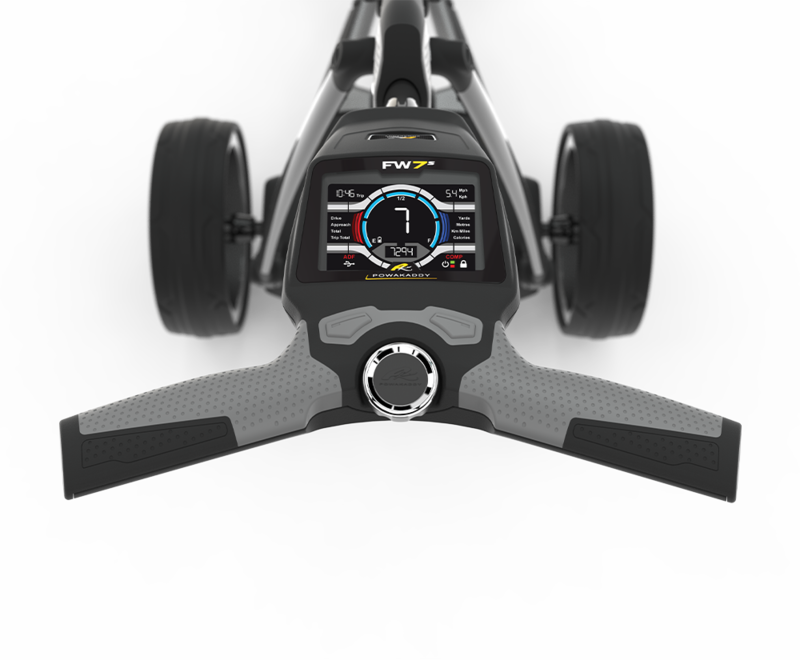 Should the trolley be veering more than 1 yard over 10 yards then you can adjust the front wheel alignment. Refer to your Owner’s Manual for instructions on how to do this. If you loosen the front wheel nuts for any reason, make sure to tighten them up afterwards. Also check that the main wheels are running freely. Dirt or mud on the tyre can affect the running of the trolley. During our prolonged life testing we use bags weighing up to 20Kg, this is extreme. However should bear in mind that more weight demands more power and this can reduce the life of your battery or reduce its range. I am having problems with my trolley/battery/charger and need to go to a PowaKaddy Service Agent, what do I need to do? I want my Battery/Charger/Trolley tested and it is in warranty. The Service Agent says he may charge me for this? I’m not happy with what the Service Agent is charging me for the repair? I need some further advice and your questions and answers haven’t covered it? First find your nearest Service Agent using the PowaKaddy website. Telephone the agent to explain the problem and arrange your visit. Explain the problem, the agent will tell you what pieces of your equipment to take along. Most will ask you to bring everything, trolley, battery and charger. If your trolley, battery or charger are in warranty and not registered be prepared to be asked for proofs of purchase. A Service Agent may charge you for testing if the item(s) tested is not faulty. In all cases you should obtain a quotation for the work from the Service Agent before giving the go-ahead. The contract for the repair of your trolley is between you and the Service Agent, charges may vary! Please telephone us on 01795 473555 or email: sales@powakaddy.co.uk. If you have a question and we haven’t answered it then we need to know. We will do our very best to answer your question, however if it’s about improving your handicap then we may struggle! * Product specifications and prices are liable to change without notification.